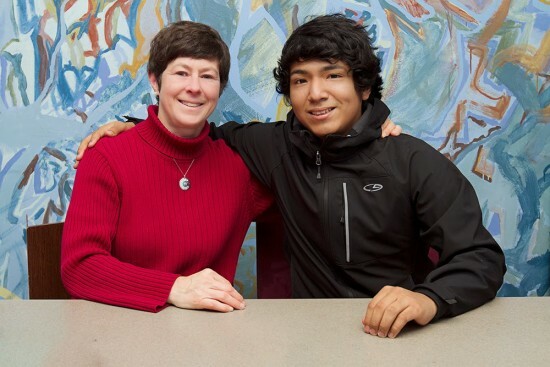 When Enrique, a high school sophomore, first met Megan, she struck him immediately as someone who could offer him “a lot of help” with his schoolwork. Over the last three years, Megan and Enrique have used their weekly tutoring sessions to tackle a range of projects including bringing up Enrique’s algebra grades, improving his punctuation skills, and learning new vocabulary words. For a recent English project, Enrique was required to memorize and perform at least 14 lines of a Shakespearean sonnet. The idea of making eye contact while delivering his lines made Enrique nervous, so the pair drew pictures of peoples’ faces and hung them around their tutoring room. Delivering his lines to this “audience” over multiple tutoring sessions paid off: Enrique earned over 100% on the project. Megan, who works in Northwestern’s media relations department, says that she enjoys tutoring Enrique in part because of his pleasant personality and intelligence. She also credits Family Matters with providing an environment that supports tutoring pairs. “You don’t feel like you’re left to your own devices,” she explains. This year, the pair’s goal is to continue working on essays and writing thesis statements, a skill that will no doubt come in handy when Enrique eventually starts applying to colleges. Although he doesn’t really like to think too much about the future, he says he might like to become an artist, or maybe a photographer. He also likes to sing and wants to travel the world. In the meantime, though, he’s focused on getting through the next few years of high school—and he’s grateful to have Megan’s help along the way.